Space Marine is a third-person action title set in the Warhammer 40K universe from Relic Entertainment; the developer behind the Dawn of War series. You play as Captain Titus of the Ultramarines Chapter of Space Marines; mankind's elite super soldiers - a fact which already presents a problem for THQ. 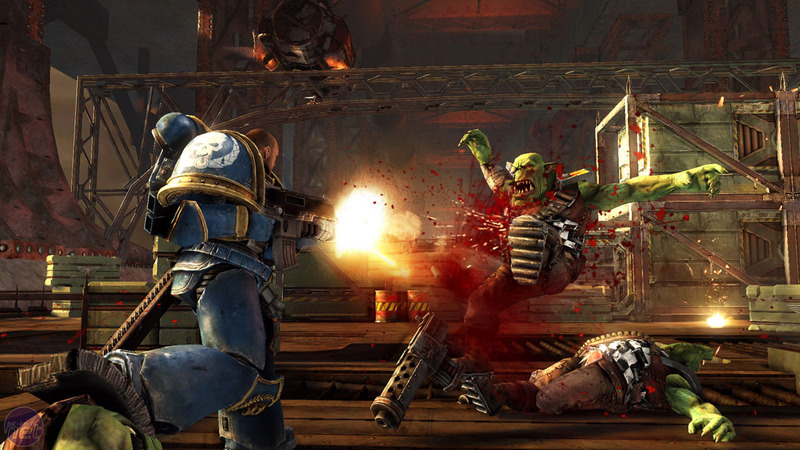 While existing Warhammer 40K fans are definitely going to be happy about Space Marine's closeness to the lore, newcomers to the franchise will have a significant amount of catching up to do. Who is Titus? What's an Ultramarine? There's a barrage of questions blocking the way for casual observers. The Warhammer 40K universe, used as a framing device for tabletop miniature battles, is dense, long-running and incredibly dark and gritty. It makes use of every sci-fi trope you can imagine and, in its efforts to pit Space Orks against super-soldiers, often borders on the absurd. It's also consistently brilliant and well-thought out, however, with a continually evolving political structure as various races and factions vie for power across the various novels and games that constitute the canon. Even the most straightforward elements are steeped in weirdness, however. The super-soldier marines, for example, which should not be a tough sell to your average gamer, are genetically modified and enhanced warriors who can spit acid and absorb memories by eating the flesh of defeated enemies. In Warhammer 40K, mankind is essentially run through a form of military fascism that runs on equal parts paranoia and religious zeal. Normally this would make for an unsympathetic cause, but it's somewhat justified given that there really are demons trying to enslave humanity from another plane of existence. Also, Space Orks. When it comes to Space Marine specifically, it's Relic's greatest achievement that it's managed to condense all of this back-story and information into a traditionally dumb third-person action title. Very early on in the single-player campaign, for example, there's a brief exchange between Captain Titus and a recently graduated marine from his squad which serves to define the various factions in the game and layout much about the character of the Ultramarines. The notion of heresy and what tends to happen to those who commit it is discussed at length, creating an interesting opening for a game that you might otherwise assume is only about squashing Orks. Thankfully, though, Space Marine is also packed with simple action moments. When one of your primary weapons is a chainsaw-sword combination then it's hardly going to be a delicate debate-filled game deliberating on the virtues of belief and blind faith. At its heart, this is a game about Space Marines, where the Space Marines in question wear hulking power armour that makes the Gears of War crowd look like anorexic pretenders wrapped in tinfoil. More important than how the marines look is how they feel. The size of characters, the way the screen shakes when you do something as simple as sprint and the way that all the melee animations are weighted gives you a real sense of the power behind the character. It's remarkably satisfying to turn some of your squishier opponents into a fine red mist, especially when that then coats your armour for a while.